Most people (voters) would like to see a fair income distribution across society. 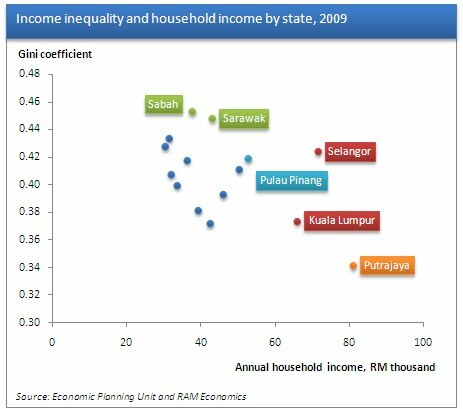 The Gini Coefficient is the popular measure for income distribution - the higher the index the more unequally distributed income is. In this regard, some economic development theorists are still debating Simon Kutznets' - who incidently gave the world the GDP concept - inverted 'U' curve theory of income distribution. The theory states that at different levels of economic development there are different levels of income distribution - where poor economies are equally distributed when everyone has the same occupation, however, as economies get richer the returns to capital (people who own machinery) will exceed returns to labour (people who do manual labour), so there's bound to be some form of inequality there. At the last stage, capital-labour ratios would be more evened out and income will theoretically be more equally distributed. By that logic (if theory does indeed hold), it's not that hard to see which part of the curve Malaysia is on now.